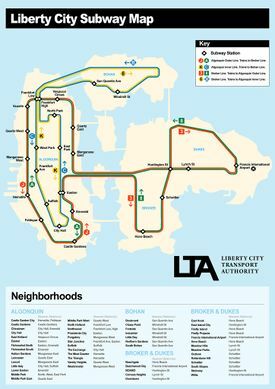 A route map of Liberty City in GTA IV, depicting the subway system's extent in Algonquin, Bohan, Dukes and Broker. Printed version of the map comes with the game case. Based on the New York City Subway, the subway in Liberty City in Grand Theft Auto IV is a heavy rail rapid transit system that serves a large portion of the city. With 26 stops and 8 routes, it is largest and most complex rapid transit system in the Grand Theft Auto world. The system is operated by the Liberty Transport Authority (LTA). The subway also appears in Grand Theft Auto: Chinatown Wars, however it is inaccessible to the player, yet trains still run. About 65% of the network is underground, with the remaining 35% being overground. The subway system does not carry over into Alderney. Virtually all stations in Broker, Dukes and Bohan are located above ground; all stations in Algonquin, aside from Frankfort High LTA, are underground, their entrances distinguishable by their green iron fencing and attached globe lamps. All stations in the system are operational except one, unofficially referred to as Dukes Boulevard station along a short stub branch of the Broker Line in East Island City; the line is also connected to a train yard located in Firefly Projects. The cost of using the subway is deducted after the trip, as the ticket machines are not operable. Subway lines can be seen on the Radar in the HUD as semitransparent gray lines, with stations marked as square lozenges. If a station is underground, multiple access points will be available front street level, typically depicted in the form of a stairway leading underground surrounded by cast iron grills with lampposts attached in the corners. Some of the city's homeless can be found taking shelter in the large junction tunnel under Lancet. The subway is a good way to escape from the police at any wanted levels. At lower levels, players may still use the train; as the AI is confused by the player entering the trains, the train may take you well outside the wanted zone. However, use of the subway trains is impossible when the player has a three-star wanted level or more, as the trains will either stop at stations indefinitely, bypass any station the player is in, or are halted wherever they are. This deliberately occurs to prevent the player from either escaping the police or easily unlocking achievements and trophies such as "One Man Army". Alternatively, the subway tunnels themselves may be effectively used by the player to escape on foot as police officers do not venture into the tunnels unless they spot the player earlier and pursue him into the tunnels. There is also a bug where the player may receive a 1 star wanted level when entering certain trains while police are nearby. This may be a bug in the game's programming as the trains are not "owned" by the player, and the Police AI is programmed to chase the player when he enters a vehicle that isn't owned by him. Subway trains are not operational, or even available, on multiplayer. However, access to the tracks is still available, and is a useful way to escape the police. Trains also run on a "rail", i.e. they cannot move from their set route, and will not stop for any reason whatsoever unless coded to, even when their path is blocked (e.g. by a vehicle). The subway lines in Broker/Dukes and Bohan are available and may be used from the beginning of the game, however as long as Algonquin is locked, only partial use of the train is possible (the Bohan line allowing only a short hop between two stations, for example), even though the trains are still shown going towards Algonquin. Full access to the subway system is granted following the mission Blow Your Cover when Algonquin is unlocked. A two car LTA train on an elevated line bound for Hove Beach station. 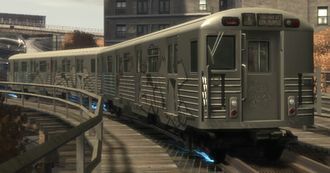 The subway trains, consist of a form of two cars or three, are heavily graffitied, and have black and white internal CCTV cameras via which the player can view the protagonist during their journey. The subway Interior can also be viewed, if you use the camera function on the player's cell phone. Doing that, reveals the actual shabbiness of the interior, that is hard to see on security cameras. The cars of the trains are based on 1966–67 New York City Subway Class R38 cars, which were completely retired by March 2009; the bulkheads of the cars feature curtain route signs and additional lights seen only on pre-rebuilt R38s (rebuilt R38s feature only a flipdot sign). The signs consistently reference the K line and "Sundance St.; Sth. Slopes" (implying Schottler station), which the K line does not serve. Like Grand Theft Auto III and Grand Theft Auto: San Andreas, it is impossible to destroy trains during gameplay. Trains are scripted to be derailed in the mission No Way on the Subway, destroyed in the mission Bang Bang, and decoupled in the mission For the Man Who Has Everything. There are no visible drivers on the trains, and trains cannot be commandeered by the player. When turning corners, trains always produce an electric blue spark from the wheels possibly due to the electric system of the rails, otherwise it may be the electric-powered brake. Trains are programmed to arrvie at stations almost simultaneously, however this may change at stations like Easton or Frankfort Low. These four lines serve all boroughs of Liberty City, but do not serve the state of Alderney. Route A trains run clockwise. Route J trains run counter-clockwise. At Easton, Route J trains become Route 3 for the Broker Line. At Manganese East, Route A trains become Route 8 for the Broker Line. Route 8 trains run clockwise in Broker, counter-clockwise in Dukes. Route 3 trains run counter-clockwise in Broker, clockwise in Dukes. At Easton, Route 8 trains become Route A for the Algonquin Outer Line. At Manganese East, Route 3 trains become Route J for the Algonquin Outer Line. Route K trains run clockwise. Route C trains run counter-clockwise. At Frankfort Low, Route K trains become Route E for the Bohan Line. At Frankfort High, Route C trains become Route B for the Bohan Line. Route E trains run clockwise. Route B trains run counter-clockwise. At Frankfort High, Route E trains become Route K for the Algonquin Inner Line. At Frankfort Low, Route B trains become Route C for the Algonquin Inner Line. There are two unused subway tunnels in the Algonquin side of the network that form connections between two other lines but are not part of regular subway routes: These include the tunnel which connects North Park Station to West Park Station and one which connects West Park Station to Frankfort High Station. Also, within the junction tunnel under Lancet, there are tracks which connect Easton Station to Manganese East Station. The interior of a LTA train in GTA IV, depicting its shabby appearance. A typical surface entrance into a subway station in Algonquin, GTA IV. Certain entrances may be double in width, although all subway entrances and hallways are only wide enough to allow movement of pedestrians and motorbikes. Platform view of Suffolk station, an underground station in Algonquin. Underground subway stations in GTA IV uses similar style platform level and concourse interiors. This page was last modified on 24 May 2014, at 11:05.